And again I say, Greetings in Christ, may you be blessed by Him as you read this update. We just arrived back from a very, very short trip to the villages. As you recall, our trip in January was short also. As my heart has accustomed to the culture in the village, I find myself not wanting to leave at the end of the trips. Oh, how I yearn for them all to grow in faith, courage, knowledge, giftings, and blessings. My heart is aching right now, as I realize I was only there a few days in January and even fewer days in February, and now I head to the United States for 2 months. I long for the people to grow and mature in faith! Please partner with us in prayer for the people of Vila Nova, Aldeia Nova, Popunha, and all other villages within our range of influence, where God desires to save the lost. I don’t have a story of perilous times crossing the lake, with beady little crocodile eyes glaring back from the dark expanses of the jungle. This time I don’t have any stories of dangerous pit vipers falling out of trees as we pick coconuts or poisonous dart frogs greeting us at our front door. I do have stories of people getting saved, of our disciples showing forth their training and confidence in the Lord and of great fellowship amongst the people. Last week, we were blessed with a visiting group of Pastors from Calvary Chapel Saving Grace, Yorba Linda California, representing our mission agency Saving Grace World Missions. It was a special time with them intent on knowing first hand what is happening in the Apurina villages where we minister. This trip was not like that. We scheduled to leave the city early in the morning and we arrived at our jungle house 11 hrs later, still before dark. 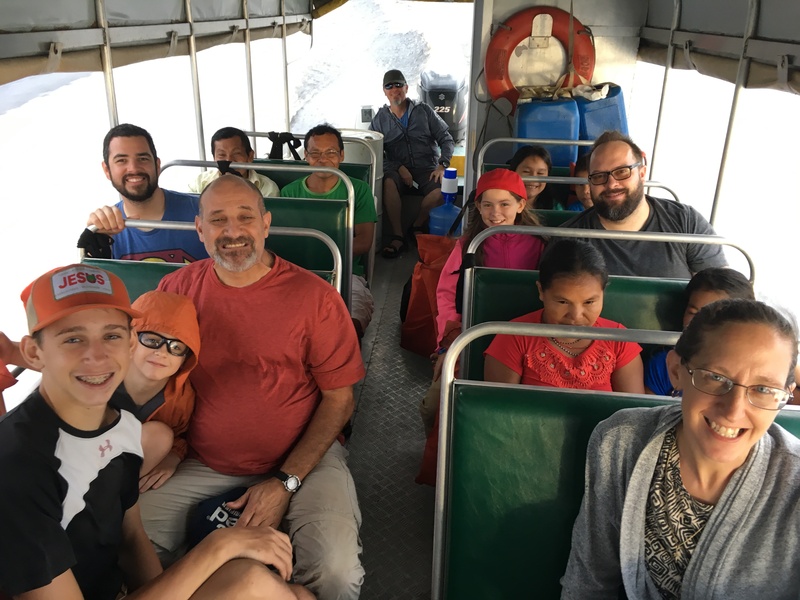 Of course, sitting on aluminum benches with only a 2″ foam seat for 11 hrs across a choppy and rainy 600 km stretch of the Amazon river is a story in itself, especially when you are travelling with children and people who are not accustomed to this type of travel. Melissa and I are not accustomed to this either. We think only the boat captain was. We had services every night in the village, with simple expository teaching of the Word of God, visiting the people in their houses during the day. We did two day trips, one to Popunha 3 hrs up river, and another to Aldeia Nova 20 minutes down stream. We had Kid’s club on Saturday, packed with indigenous children and led by Pr Joel, Veronica, and Raimunda. Want to see a video of that? Click Kid’s Club. We also had Women’s Bible study on Friday and a Baptism of new believers on Sunday. And on top of all of that, 5 young ladies(14-22 yrs old) gave their lives to Christ! 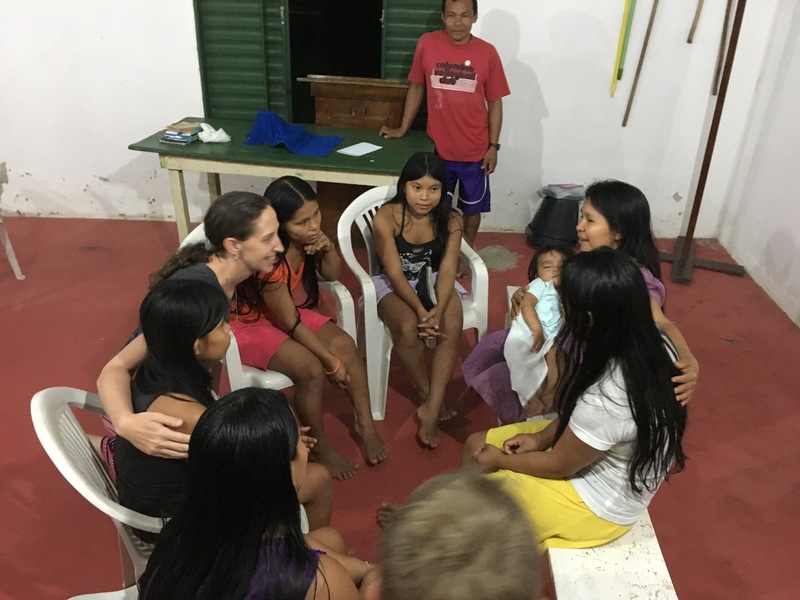 Melissa quickly gathered the 5 young ladies, leading them into a committed time of discipleship with Analucia over the next several months while I am in the U.S.
Trent, Mike, Tim and Joel, the visiting Pastors did great. Melissa and I reminisced our own arrivals 8 years ago, as we saw them stretched beyond their comfort zones, falling out of their hammocks, one deciding to sleep on the hard wood floor, walking through the muddy and spider infested paths of the rainforest, climbing up makeshift ladders into houses, and receiving the outpourings of emotions from Valdeci and the others, who were overjoyed with the Americans for giving up their lives and families to love on them and visit their houses in the the “selva” (interior of the jungle). It was hard to leave after only 4 days. In Aldeia Nova, after having a great Spirit led service with Pr Tim teaching in Luke 15, we saw where the people had cleared off a large section of Forest in order to start construction on the new church building. I was impressed with the size of the land. I am sure it will seem smaller once the building is on it. A short trip, but there is much more I could share. Want to know more? Find out where I will be in the U.S. over the next two months and come hear a first hand account of everything the Lord has down through us, the people in the forest, and you by your faithful prayers and financial support. Click Upcoming Events to know more.